Each frame is .1 seconds apart. 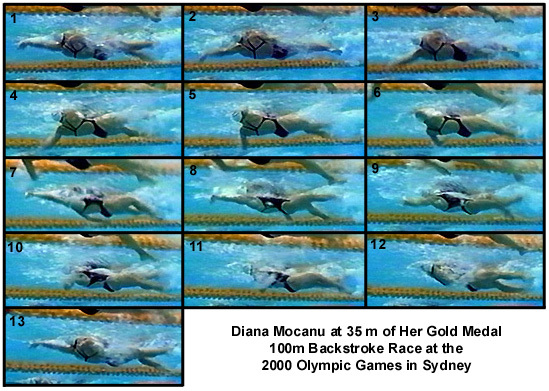 Diana Mocanu's time for this race was 1:00.21. Both hands orient the arm to pull immediately upon entry. As the hand is turned out and backward, the upper arm begins to adduct. There is virtually no lost time before propulsive forces begin to build on the hand/forearm surface. The left arm develops very strong drag-force propulsion once its direct force is developed (frame #10). The "milky" water is evidence of the turbulence created on the back of the hand/forearm propelling-surface. The swimmer's streamline could be improved. The head is too high causing the hips and buttocks to be too low. This position increases the cross-sectional surface that is presented to the water and markedly increases resistance at fast velocities. The amount of shoulder roll exceeds that of the hips. It is possible this swimmer's performance could be improved by rolling the hips more in unison with the shoulders. Extra hip-roll would also facilitate a bigger, and possibly more propulsive, kick.